Learn to use Final Cut Pro X.
Edit videos faster. — Learn the tools, strategies, and shortcuts to make videos quicker. Editing doesn't have to take so much time. Publish more often. — Once you learn to edit faster you'll release more videos, expand your reach, and grow an audience faster. Increase your income. — Finish projects on schedule, get more clients, sell more products, and earn more money. You're not just learning how to edit videos faster. What else could you do to make your videos better or grow your business with all the extra time? Quickly move through your edit by using keyboard shortcuts, in-to-out points and keywords. Editing does not have to be time consuming. Spending too much time on an edit feels exhausting. Free up your time by learning the tips and tricks we offer in this course. One of the more common struggles shared with me from other video creators is not being able to publish as much as they would like. Often the source of the problem lies in post-production. Editing becomes a bottle neck. Learning to perform an edit proficiently sets you up for success and allows more time to film and plan more videos. Attract raving fans by publishing consistently. Share your videos on social media channels and blogs to engage followers and build your email list. If you aren't publishing consistently you will become background noise. The faster you edit, the more you publish, and the larger your audience grows. If you could film and edit professional videos in a short amount of time, who do you know that would hire you to make them a video? Technical know-how and practice may be the only things keeping you from starting a video production side hustle. Editing software is hard to understand without the correct tools. We make it easy by giving you the essentials while leaving out the frills. Good looking videos can be made while filming, but great videos are made during the edit. You will become a proficient editor within Final Cut Pro X. Making videos can be time consuming and the edit often slows content creators down; that's why we teach how to edit faster and ship more videos. The video tutorials will teach you exactly what you need to know about using the software so you can actually have fun editing videos. Final Cut Pro X is one of the best video editing softwares out there, but is still intuitive to learn. Even if you're new to editing, you won't feel overwhelmed. You will control your pace so you can move through the course at your own speed and track your progress. Once you enroll, you get immediate access, for life. Any updates we create for this course in the future will be given to you for free. Get this 13+ hour bundle if you want to learn how to film & edit videos. This is everything I wish I knew when I started making videos. Through 111+ video lessons I share every step of my process. The DIY Video Production Guide covers the first steps of scripting and planning videos all the way to off-loading your memory cards. It starts with gear recommendations like choosing cameras, lens, microphones, and lighting. 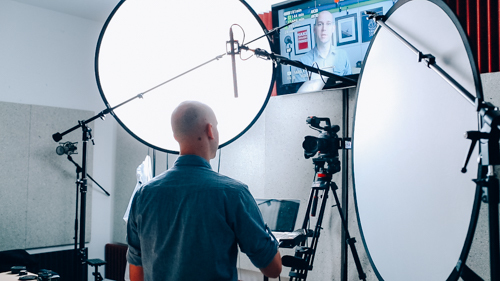 You'll also learn how to set up a video studio with multiple lighting techniques, plan your b-roll, use a green screen, choose a microphone, reducing echo, shoot with multiple angles, deliver a script with or without a teleprompter, and more. Learn Final Cut Pro X starts with basics like workspaces and file management, then goes into how to edit a sequence, syncing video & audio, using multicam, text effects, transitions, and more. You'll also learn how to edit audio, color correct & grade your footage, key for green screens, save hard drive space, and work with external programs like Compressor and Motion. Get this class if you want to become a better editor. This is everything I wish I knew when I started using Final Cut Pro X. Through 36 video lessons I share every step of my process for editing a video in FCPX. This course covers importing, organizing, editing, color correction, audio sweetening, and exporting a video. It starts with basics like workspaces and file management, then goes into how to edit a sequence, syncing video & audio, using multicam sequences, text effects, transitions, and more. You'll also learn how to edit audio, color correct & grade your footage, key for green screens, save hard drive space, and work with external programs like Compressor and Motion. Anyone who wants to get better at using Final Cut Pro X. This course will be helpful for people ranging from complete novices to those already editing in FCPX who want to edit faster. "I'm just starting out. Are these courses for me?" Yes, this is a perfect place to start. Honestly, you'll get the most value out of the courses since you'll be starting at square one. I'd highly recommend one of the bundles so you can learn to not just edit videos, but film them better too. Upon purchase you'll get access to stream them over the web (even on iOS devices). Completely. Watch each lesson when you are ready to move on from the next. You can access any lesson from day one and my course hosting software allows you to keep track of where you left off. He currently runs a two-person video production company in San Diego, California whose clients range from Pat Flynn at Smart Passive Income to tech startups like Gumroad and Teachable.